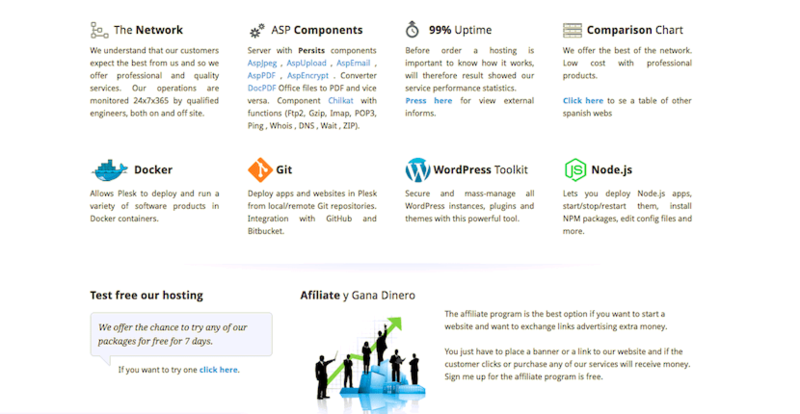 lomasbuscado.net Review 2019: Is lomasbuscado.net a Good Hosting? lomasbuscado.net is a Spanish website hosting company. They offer a variety of hosting services along with beginner-friendly tools. lomasbuscado.net is a no-frills Spanish website hosting provider that offers a wide range of hosting services. Other than their hosting packages, they provide very little information about their company on their website. Their servers are located in America, the United Kingdom, France, and Spain. Their website is available in both English and Spanish. lomasbuscado.net offers a selection of services that includes domain registration, shared hosting, adult hosting, reseller hosting, virtual private servers, and dedicated servers. It’s important to consider lomasbuscado.net’s uptime guarantee as it is a little unusual. On the homepage, they state that they guarantee 99% uptime. However, they also state they have an “attempted 99.9%” uptime. This is a little confusing and, if the 99% uptime is correct, it’s a lot lower than the industry norm. On top of that, they don’t appear to offer automatic daily backups. However, what I really like is their transparency. On their website, they have a server status page showing the dates and reasons for any downtime. It’s also important to note that their average uptime is well above 99%. Iomasbuscado.net has a few nice features for beginners. Firstly, they have a website builder that includes multiple ready-made templates. Secondly, they have a one-click installer for popular platforms and scripts, and they also offer a service to help webmasters install programs on their websites at an added cost. Finally, their hosting is compatible with e-commerce platforms such as CubeCart, osCommerce, Avactis, phpCOIN, Zen Cart, and Magento. The three lowest-tier packages are very cheap. However, these include very few features and low resource caps, so they’ll likely only be suitable for the most basic websites. The higher-priced packages, on the other hand, are relatively expensive when compared to both local and international competitors. They offer a monthly rate and also an annual rate. What’s great about them is that they offer really steep discounts for purchasing a one-year term. There is no money back guarantee; however, they do offer a seven day free trial. On top of their hosting plans, there are a few hidden costs that must be noted. While domains are included free of charge in all but the lowest-tier packages, there are added costs for setup, support, and SSL certificates. Although these are negligible amounts, it’s quite unusual for setup and support to be an extra cost. Customer support is quite limited. They offer email, MSN, and SMS support only. Unfortunately, when I contacted them via email, I never received a response. In an ideal world, I’d like to be able to contact their support via live chat or perhaps over the phone to get an instant response. That said, their technical support center is open 24/7 for existing customers, which likely means technical and urgent enquiries get a much faster response. They also have a fairly detailed help center on the website, which allows you to resolve issues without contacting support. Iomasbuscado.net likely won’t win any awards for stellar customer service, but they have a range of inexpensive single-domain plans and beginner-friendly tools excellent for small website owners just starting out. Wondering how lomasbuscado.net stacks up against other Web Hosting companies? Enter any other Web Hosting company and we will give you a side-by-side comparison.